(a) Provisionally tighten the bleeder plug to the disc brake cylinder. (b) Install the bleeder plug cap onto the bleeder plug. 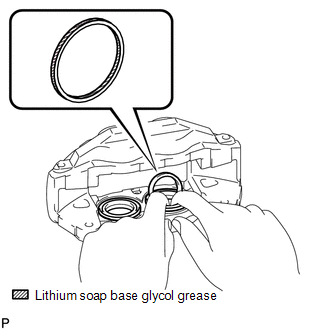 (a) Apply lithium soap base glycol grease to 4 new piston seals. (b) Install the 4 piston seals onto the disc brake cylinder. 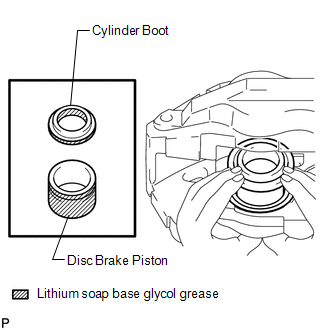 (a) Apply lithium soap base glycol grease to the 4 disc brake pistons and a new 4 cylinder boots. (b) Install the 4 disc brake pistons onto the disc brake cylinder. Do not install the disc brake piston into the disc brake cylinder forcibly. (a) Install the 4 cylinder boots onto the disc brake cylinder. Install the cylinder boot securely onto the grooves of the disc brake cylinder and piston. 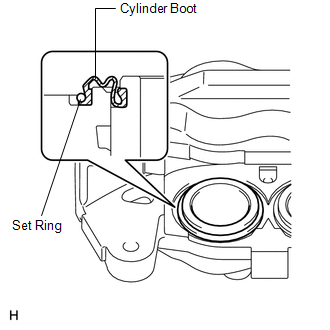 (b) Install the 4 cylinder boot set rings.